Born and breed in Santander (North of Spain), his first contact with Electronic music comes from 90´s UK sounds that lately will make a fundamental role as his influences and inspiration. As a teenager he began to discover club culture in his local area being heavily impacted by the sounds of British techno either as Birmingham harsh beats or Sheffield and Warp’s IDM sounds. 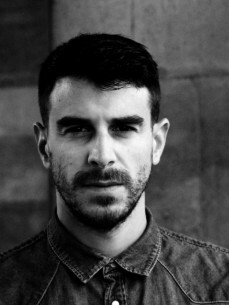 In 2000 he moves to Barcelona and soon the need of being active instead of passive makes him start experimenting with electronic music creation, using software and becoming part of the Agony Forces Project (from 2006 to 2013), first as a trio then as a duo leaving a bunch of Eps released. 2007 marks the starting point of his now primary outlet: P.E.A.R.L. releasing his first EP in Christian Wünsch’s Tsunami Label, followed by several releases under various aliases like RHEA for the cult label Semantica Records or Basqiam on the american label Detroit Underground. In 2012 he moves to Berlin and one year after feels the need for having his own imprint founding Falling Ethics Records, first as an outlet for his own productions and lately opening the doors to other creators like Dimi Angelis or The Transhumans. Celebrating in February 2017 his 10th vinyl release. During this period he releases works for essential labels like Warm Up Recordings, Float Records, 47 Recordings, PoleGroup or Transhuman Records and also his cooperation with Marcel Heese as PMH. 2017 is going to be a pivotal year on his career, with the release of his first Album Temptation through Impatience to be in all stores this spring on his very own Falling Ethics and his addition to the PoleGroup family. As a performer he is a solid live act and also an excellent selector in the dj booth, combining the pulse of aggressive beats with mental, ambiental and experimental flavors.